Ibérico Bellota Ham for sale. Buy online at Zingerman's Mail Order. Gourmet Gifts. Food Gifts. 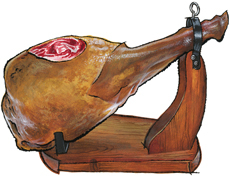 While hind ham is more popular, front shoulder ham—called paleta—is revered among jamón aficionados. They have darker, more flavorful meat. For example, when Sam Edwards, the third-generation American ham curer visited Spain, time after time he told me he consistently chose paleta as his favorite in blind tastings. I also think paletas make a better choice for a home ham since they’re about half the size and won’t dry out as quickly. The ham, which is unsmoked and cures for 24-30 months, is heirloom black Ibérico hog, the legendary pigs who spend their final months living in the Dehesa oak tree forest on a diet of acorns (bellotas)—up to twenty pounds per pig per day. The acorn diet creates incredible fat that melts in your mouth in a way that seems completely surreal. The texture and flavor of this cured ham are incredible. It's something we should all experience at least once in our short carnivorous lives. This is one of the pinnacles of meat eating, an experience unlike any other. A very special gift. To slice, use a sharp knife and work the ham lengthwise. Don’t worry about getting big slices—focus on keeping the pieces thin, and make sure your bite has a little bit of meat and fat. No cooking necessary - the ham is best served as is, like you would prosciutto. Need a stand for your ham? Grab one here.